simple weekend dressing for a day of errands and visiting dear friends and their beautiful baby: favorite white steven alan shirt, blue jeans and Ferragamo pumps. perfect for a surprisingly un-January-esque day after frigid temperatures all week long. looking forward to catching up on episodes of Downton and The Wire, and a nice long weekend ahead, rounded out by inauguration coverage on Monday (happy MLK Day!). what are you weekending in? That's a terrific weekend outfit. Casual chic!! How are you finding Downton? I was totally charmed by the first season and completely fell out of love in the second; didn't even finish it. It's NOT a good thing to eyeball your Ferragamos. The more I see them, the more I want them. Just a question about you new Churchs brogues..
Did you get yours from NAP? With the sizing, did the full size down feel tight in the toe box/length? I can handle shoes that are tight in the width to start off with as that always moulds to my feet, but I can't handle it when the toe box is too small. no these are new :) i had a pair of vintage ferragamos but they never fit quite right, alas. Hope you enjoyed the long weekend. 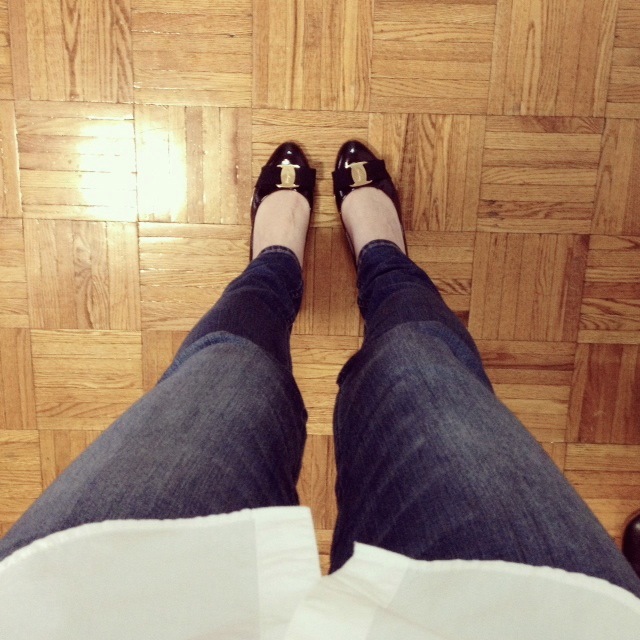 I think the Ferragamo flats truly finish off just about any outfit. Ahh the Ferragamos. Such beauties!